Are you finding it impossible to get enough done in your business? You've decided to build your business, learn more about marketing, create content for your website, and network more. Perhaps you’ve got a few other ideas too. Do these goals stall out at the planning stage? I put together these 25 productivity hacks especially for therapists because I want you to get the important stuff done without working more. These hacks have helped me make progress in my businesses, and many of them have worked for therapists I work with. I hope some of them work for you! Hack #1: Don’t use your email inbox as your to-do list. Your email inbox is a great tool but a terrible master. It can lead to distraction dozens of times a day. I achieve inbox zero at least once a week. That doesn’t mean I’ve accomplished everything associated with every email I received. It means I’ve taken care of the urgent emails and put other tasks onto my to-do list. Hack #2: Categorize different kinds of tasks and schedule time for each category. Obviously, this is the time you spend serving clients. These tasks include writing articles, creating content for courses, creating outlines for talks, and learning new skills. This kind of work is best done in chunks of 90 minutes or more, and I don’t bother tackling one of these items if I have less than an hour available. I often feel resistant before I delve into this kind of work, but once I’m in that zone, it’s easier to stay there. This includes any task that involves calling or. This requires social energy, and once I’ve transitioned into that energy, I can work through all of those items. Networking, whether it’s returning emails or calls or reaching out to people, belongs in this category. These tasks require attention to detail. Some of these tasks are writing notes, paying bills, tracking numbers, and monthly reports. Hack #3: Make checklists of all of your mundane weekly tasks. Run through them as quickly as possible so you can save your time and energy for more creative tasks. Hack #4: Set up your to-do list at the beginning of each day or the day before. Decide what you’re going to do every day before you start. This prevents you from getting scattered throughout the day. Hack #5: Use Pen and paper for your to-do list. I use the Asana app now, and I’ve tried a lot of other task management systems too. Still, at the beginning of each workday, or sometimes the day before, I make a list on paper. Crossing items off one by one is concrete and satisfying. Hack #6: Complete all your client-related paperwork during the part of your day set aside for client work. Write notes between clients so that you never have to catch up. Take care of any invoicing, charging credit cards, or insurance related paperwork before you leave your office each day. If you need to add half an hour in the middle or at the end of your time with clients, do it. Don’t allow these items to swallow up your time or hang over your head. Hack #7: Create a marketing checklist. You’ll tend to make marketing more complex than it needs to be if you try stuff with no system. Decide the minimum marketing you’ll do each week. I encourage every therapist I work with to create a flexible marketing checklist. Your checklist should include all the marketing activities you plan to try and how often you plan to work on each one. Hack #8: Create a model week. You can do this in Google calendar, a paper calendar, or anywhere you like. Create the ideal week, in which you assign every task to a time. Plug in your sessions, your admin time, your marketing time, your networking time, exercise, self-care, social time, and everything you need and want time for. Work to move your actual schedule as close to this model week as you can. Return to your model week often to remind you how to set up your time. Hack #9: Create a brain dump. Do you have dozens of items on scraps of papers and stored in different places on your computer and phone? Pull them all together in one place so that you don’t have to hold them in your head. This isn’t your to-do list, because that would be too overwhelming. You’ll accomplish some of these items soon, but some won’t happen for a long time, or ever. Use your to-do list for you for those items that you’ll deal with in the near future, and leave the rest on the brain dump list for another day. Hack #10: Estimate the amount of time every single item on your to-do list will take. When I add an item to my to-do list, I always include a number of minutes next to it. I don’t write, “check email,” rather I write “check email 10” meaning I intend to spend 10 minutes on email. I “write article 120” meaning I plan to spend 2 hours on an article that day. This practice forces you to be realistic and kind to yourself when you plan your day. When you add up the items and they take up more time than you have available, you decide what you’ll move to another day. Hack #11: Create productivity rituals. Set up your work time up so that it feels special. This is your special chair. This is your mug with your favorite tea. This is the stretch you do before you sit down. You’ll come to associate your rituals with being productive. Hack #12: Find an Accountability buddy. Set up “get it done” day with a friend. It doesn’t matter if you’re rewriting your home page and she’s cleaning out her closet, as long as you both intend to focus. Start at a predetermined time and check in by phone for a VERY short time about what you’ll both accomplish. Check in again 2 hours later. Report back briefly and get back to work. When you’re done for the day give one final report and congratulate each other. Many of us thrive on accountability, and this is a free way to get some. Hack #13: Get unstuck by taking a small step. If an item lingers on your to-do list for months, decide whether it really needs to happen. If it does, identify the very first tiny step. For example, maybe you’ve got “create a web page about depression” on your to-do list, but you don’t know the technical steps to create a new page on your site. Your first tiny steps are to figure out what your technical question is and then to get that question answered. Don’t allow online to become your default setting. I don’t allow myself to bounce around from site to site while I’m working. I stay focused on my task, and if questions or ideas come up that need my attention, I write them so I can let them go now and tackle them later. Have a hard time staying offline? Go somewhere with no Internet or use an app like Freedom or Anti-Social. Hack #15: Get rid of your worst app. Gretchen Rubin and Elizabeth Craft of the podcast Happier suggest that you "delete a soul-sucking app off your phone." Many of their listeners have deleted candy crush or Face book. One tip from their listeners is to take FB off your phone so you can only access it from your computer. Hack #16: Make a plan about when to return calls and emails from potential clients. Maybe you want to cut back on how often you check email and voicemail, but you still want to check for potential client inquiries 5 times a day. Create a boundary for yourself that you’ll ignore all other messages sometimes so these checking times don’t become opportunities for distraction. Hack #17: When you’re working on something that requires focus, resist the urge to do something easier. You’ll notice that when you schedule time for writing or any activity that requires intense focus, you’ll start jonesing to take care of something else urgent and easy. You’ll desperately want to pay a bill or check your email or look up an article. As you resist that urge, you’ll not only get a lot more done, but you’ll strengthen your ability to concentrate next time. I think therapists are better about this than the average person. We’re practiced at shutting off devices and distractions and going deep into sessions. For 50 minutes or more at a time, often several times a day, we focus intensely. We just need to do this more outside of sessions. Hack #18: Schedule a walk in the middle of your workday. This may seem counterintuitive if you need to be productive. When we completely unplug and go on a walk, we’re better able to solve problems and focus when you return. Hack #19: Observe your distracted thoughts for a moment without acting on any of them. Hack #20: Ask yourself how you’d focus if you had 3 clients in a row right now. Somehow all of those distracting thoughts and competing priorities would leave your mind. You’d give your clients your full attention. Now try to tune out everything else and give the tasks you’ve chosen that same level of attention. Hack #21: Clear a space. Don’t procrastinate with a daylong desk-clearing day. 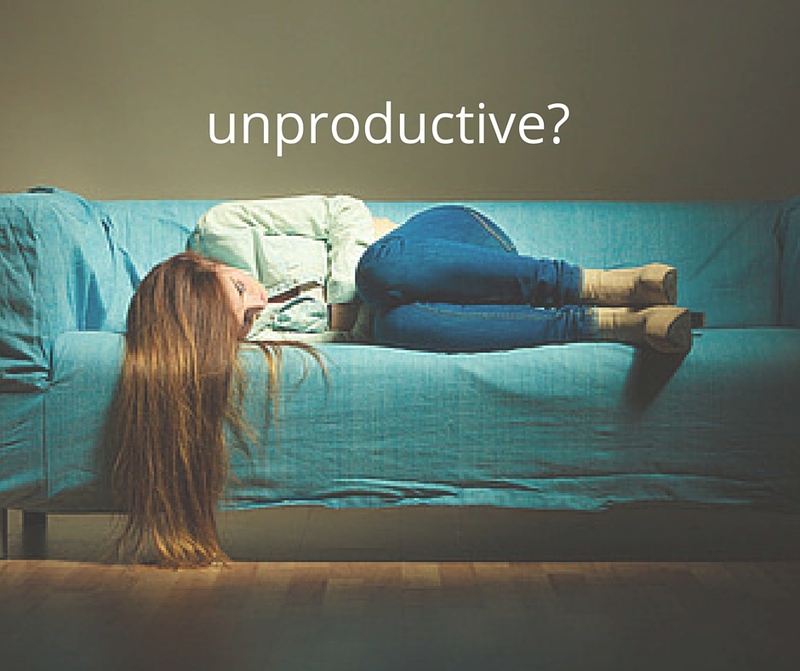 Even a productivity hack can become a distraction. Just move the clutter out of your way. Hack #22: Set a timer. Until the timer goes off, you’re not allowed to change your mind about your area of focus. Hack #23: Choose your priorities every quarter or so. Knowing what you want to accomplish one to three months from now will help you focus and ignore out what’s less important. Hack #24: At the beginning of your workday, picture yourself at the end of your workday several hours from now. What will your future self feel happiest to have accomplished? Hack #25: Make your Monday to-do list on Friday afternoon. I used to waste time on Monday morning figuring out what to do first. After two days away from work, I had to get centered, catch up and remember what I was in the middle of the week before. By making my Monday list on Friday, I can let go over the weekend, and get right to work on Monday morning. Want more free advice, hacks, and resources? Sign up below and you'll have a business coach in your inbox every week. Unsubscribe at any time. What Sets Apart Therapists With Successful Practices? Therapists with successful practices tend to spend their time and energy differently from great therapists who don’t have the practices they want. As a therapist in private practice, there are 3 kinds of activities you spend time on in your business: providing services, taking care of the day-to-day, and moving your business forward. The time you spend with clients providing therapy falls into this category. All of your income and most of your work satisfaction probably comes from providing services. This is all the stuff you regularly do to run your business besides providing the time you’re in the room with clients. Day-to-day activities include answering your phone, paying bills, writing notes, managing your billing, going to consultation group, charging credit cards, and answering emails. It also includes maintaining your marketing. If you write a blog, give talks, or network, you can include that in this category. This third category includes the tasks you don’t HAVE to do in order to maintain your business where it is right now. It’s the time you spend moving your business forward. This category includes the time you put into dreaming about your business, looking at the big picture, learning new business skills, creating goals, and getting inspired for the business you want to move towards.Therapists who put time into this category tend to succeed at making more money and creating businesses they want to run. How much time should you put into moving your business forward? At the very least, one hour or more per week. More is better. Let’s look at some specific activities and tasks that will move your business forward. Reading articles and books about business. Hey, you’re moving forward right now! I'll give you an example of why this time makes such a big difference to your business. A therapist I’ll call Sheila came to me with a very full practice. She had a caseload with 80% insurance based clients and 20% private pay clients. She loved her clinical work, but she was working too many hours and needed to increase her income. She knew if she added more hours she’d burn out, but she wasn’t sure what else to do. She signed up for my Superpower Method For Therapists™ Program, and using that process she created a new plan. Even though she was working full time, she started putting at least 2 hours per week into “moving your business forward” activities. She overhauled her website to reflect a niche and created a new business model which included group therapy. Within 6 months she had launched her group and her percentage of private pay clients was on the rise. She was following a step by step plan to move off of insurance panels. She was able to slightly cut back her hours while increasing her income. When I run the Superpower Method For Therapists™ Program, the participants do a lot of work. We have group calls 2 times per month, and the lessons and homework assignments between calls can take 2 or more hours per week. I also give bonus challenges to help participants move their businesses forward even more if they’ve got the time and energy. At the end of the program, participants see that they’ve managed to carve out 2 or more hours per week to move their businesses forward. Many participants then commit to continuing to carve that time out after the program is over. But how can you possibly do more than you're doing right now?! So I know you don’t have an extra 2 or 3 hours per week lying around on your calendar. You’d love to put time into this “move your business forward” category, but you’ve already got a long to do list. You can’t add more. If you're already working full time, you're a parent, or you're burning out, you have to get creative about what goes on that STOP doing list. You’ll probably find all of the items for your STOP doing list within your day-to-day tasks. In both of my businesses, I pay for excellent help from someone who takes huge items off of my “day-to-day” list. She does them so well that I can truly let them go. I rely on systems like my practice management system which includes billing and online scheduling. Many therapists have found that using an online practice management system takes hours off of their day-to-day work. If you’re spending time emailing or sending voicemail messages back and forth about scheduling, find a better system. Your turn. How can you take action now to move your business forward? If you liked this article, get practice building help dropped in your inbox every week. You’ll get stuff I don’t share anywhere else. You'll get no spam from us. Easily unsubscribe at any time. You’re growing your practice. That means when you’re not seeing clients, you’re returning phone calls, answering emails, marketing, networking, and trying to tackle a huge to do list. Overwhelmed yet? I spoke with Frances Harvey, founder of My Solution Services about how to get out of overwhelm. She and her team help therapists with all of the everyday tasks of running a solo or group practice. In this conversation, Frances talks about how to take tasks off your plate so you can focus on what matters to you. At the end of the interview, you’ll see 2 surprise guests. #1: Breathe! It’s common for therapists in private practice to feel overwhelmed. #2: You’re not supposed to do it all yourself. You need to offload the things you shouldn’t be doing so that you can focus on the things you should be doing, like providing excellent therapy. The most common things therapists ask me for help with are #1 phones and scheduling and #2 billing. Phones and scheduling are critically important to your private practice. That’s your life line, so it’s scary to hand them over. But most of the time I hear therapists say that they often can’t return calls until 10 at night or that it’s sometimes 3 or 4 days before they can return a call. That’s not good! When you’re at the point where you’re not returning calls promptly, you need help. I've developed a step by step system for handling phone calls. 1. Create the relationship with the potential client. “Hi, how are you? I’m glad you called. My name is Frances.” Within a few seconds we’ve created some rapport. 2. Create a safe place and ask them to tell me what why they want to come in for therapy. 3. Create value. We have a detailed profile for each therapist in our system. We know how long you’ve been a therapist, your fees, what you specialize in, and everything you can possibly imagine. We pull up that information right away and it seems like we’re sitting right there in your office and we’ve known you for 10 years. We’re able to create value for the client and let them know why it would be a good idea to come and see you. 4. Handle logistics. We give them all of the information they need including fees, length of session, and what to expect in the session. Then we move into scheduling an intake. 5. Do the follow up work, which may include a confirmation email to the client and a message letting the therapist know we’ve booked a session. It’s a very structured process. My staff receives about 15 to 18 hours of training on this process, including role-playing the calls. What tasks should you hand over? When I talk to a therapist, I help them make a big list of everything they need to offload. I help them prioritize the top 3 most important things they need to take car of, and then we identify the #1 task that we will start with. If you know you need help, but don’t have any idea what to offload, I give you an assignment. Take a week or two, and make a note in your smart phone every time you’re doing a business related task. For each task, ask yourself: Should I be doing this task? Should I be using my time on this? Note your answer next to each task. I often ask therapists: If I gave you back 10 hours a month, what would you do with it? It’s critical for you to market and network with your colleagues. And what about spending time with your family?! You may have to push yourself to hire help before it’s easy to afford because you may need those 10 hours to take your practice to the next level. To get in touch with Frances and set up a consultation, go to mysolutionservices.com or email her at frances@mysolutionservices.com. Get resources to build your practice every week, right in your inbox.